A powerful earthquake hit Myanmar Thursday near its borders with China, Thailand and Laos, the U.S. Geological Survey said. 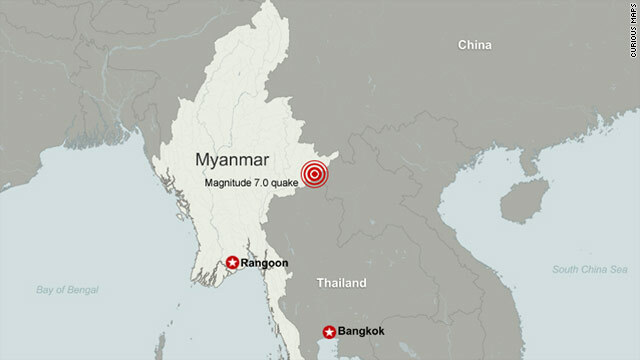 The quake hit in eastern Myanmar, about 55 miles (89 kilometers) north of Chiang Rai, Thailand, the survey reported. It had a magnitude of 6.8, the survey said, revising the estimate down from an initial reading of 7.0. It was a relatively shallow quake, which can be very destructive. The Geological Survey initially said the quake had a depth of 142 miles (230 kilometers), but it later revised its estimate to say the quake was 6 miles (10 kilometers) deep, putting it fairly close to the surface. A second quake hit about half an hour later, with a preliminary magnitude of 4.8, the USGS said. The center of the quake was 589 kilometers (365 miles) northeast of Yangon, and 772 kilometers (479 miles) north of Bangkok, Thailand. It was 104 miles (168 kilometers) south-southwest of Yunjinghong, Yunnan, China. A destructive tsunami is not expected, the Pacific Tsunami Warning Center said. In advice to government agencies, the center said the quake "is located too far inland and too deep inside the earth to generate a tsunami in the Indian Ocean." MAY 21, 2011 !!! Familyradio.com. Take it seriously or despise it !! MARK YOUR CALENDER !! MAY 21, 2011 the Day of The RAPTURE ! Another fine place to get a milk shake! GOD said this was going to happen in the end. And with Obama and all his stuff is also paving the way to the New World Order. Can I get and AMEN Now when the Obama claims to be the Messiah. Oop's I mean the antichrist.... Which will be real soon here. Not in 2012 like people think, but more like May 2011. Can I get an AMEN! Interesting how these killer quakes only seem to hit pagan countries.